The second stop of the day is in Antipaxos for 1 hour. Here you have the choice of swimming in the crystal clear waters or just sitting back and enjoying the beautiful scenery. Few places today are blessed with the tranquility of this untouched island. 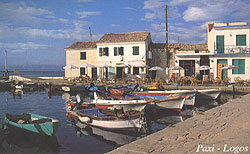 The last stop of the day is in Gaios the capital town of Paxos. Gaios is a bustling little town with many shops, bars and quayside tavernas; an excellent place to sample traditional Greek food or shop for some unusual souvenir's made on the island. AND VISIT THE BLUE LAGOON. Only a 25 minute crossing to reach the historic sea caves of Mourtos; where during the second world war Greek naval battle ships hid underneath the lighthouse there. Our second stop of the day is to the beautiful bay where the Blue Lagoon was filmed. The Britannia will moor there for 1 hour. You can try your luck at champagne diving or just swim in the exotic waters of the Blue Lagoon. 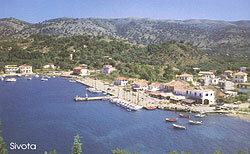 Our last stop of the day is the village of Sivota. 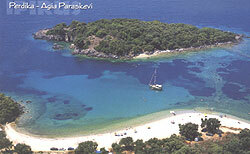 Sivota is a quaint, picturesque fishing village with many shops to explore. On your return journey around the small islands of the Ionian Sea, you may note that many years ago naval battles were fought by the Greeks to protect their islands. 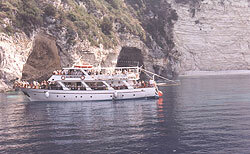 Many of the vessels were sunk and their relics still remain at the bottom of the Ionian Sea. 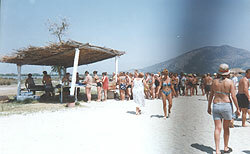 Enjoy a wonderful day out on an authentic Greek beach B.B.Q. Leaving Kavos at 10:00 am. We arrive 1 hour later at a beautiful secluded beach on the Greek Mainland. Here the fun and the games start while your chicken B.B.Q. diving on your return to Cavos. CORFU BY NIGHT - THE BEST WAY TO SHOP ! Take in the sights of Corfu's golden coastline while cruising to town; have your cameras ready as we pass by one of our most photographed tourist attractions Pontikonisi (Mouse Island). 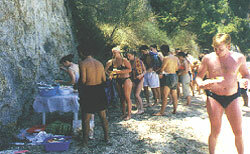 On arrival in Corfu Town there are many things to see and do. You may choose to see some sights such as the old port, old fortress, St. Spiridon Church or the Palace etc. The narrow streets of Corfu Town are filled with an abundance of fine wares, beautiful Corfiot lace, pottery, leather and much more. If you are feeling hungry after your sightseeing or shopping, tempt your taste buds in one of the roadside tavernas, all serve Greek and international cuisine, or just watch the world go by from the Liston, a row of famous coffee houses visited by the royal family when on the island.